Swoon Style and Home: Blue Bathroom - Check! I have to apologize for my absence lately. I was so busy at work and busy training in September. I trained for, and completed, a sprint distance triathlon and an olympic distance triathlon and also ran a half marathon. I just got back from a weekend-long 200 mile Ragnar relay race, which was one of the most fun experiences ever. And I am currently training for the Philadelphia marathon in November. Needless to say, my weekends and "down" time are a little busy. But, I want to be better about blogging, so I will. A month or so ago I posted about my plans for the space. The plans were simple: paint, add some new fixtures (on the cheap from Target) and decorate. I am happy to report that the room is done and took hardly any time or money at all. Here are the before and afters. 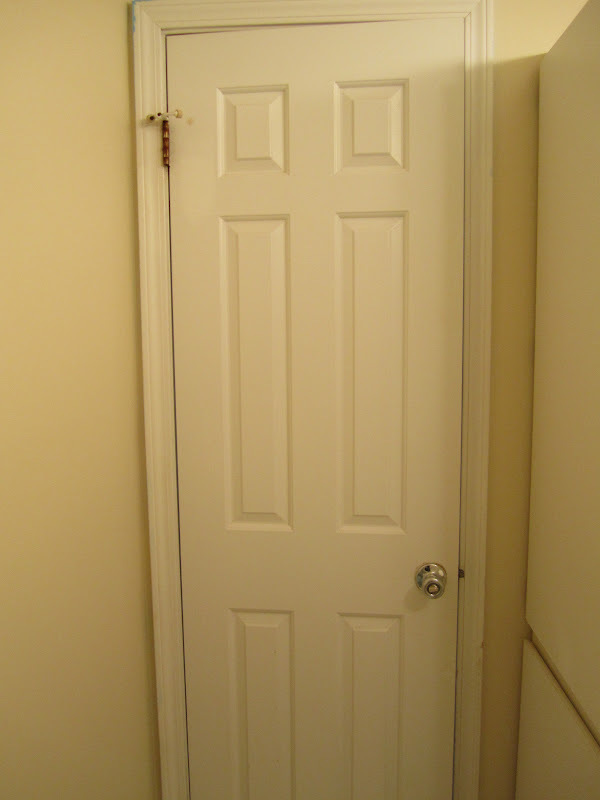 Before: the tan walls did nothing to help the room. The brought out the tan in the tile, and the whole room just looked dark and kind of dirty. 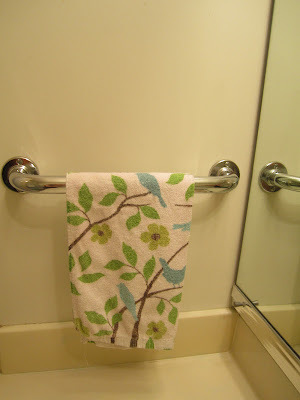 Before: the towel bar and toilet paper holder looked like plumbing supplies. I could not stand the sight of them. 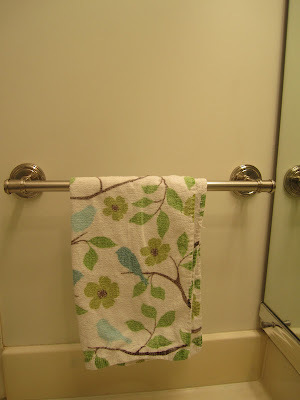 After: I bought brushed nickel fixtures from Target - a new towel bar and a new toilet paper holder. They set me back about $25 total, but really make the space look better. 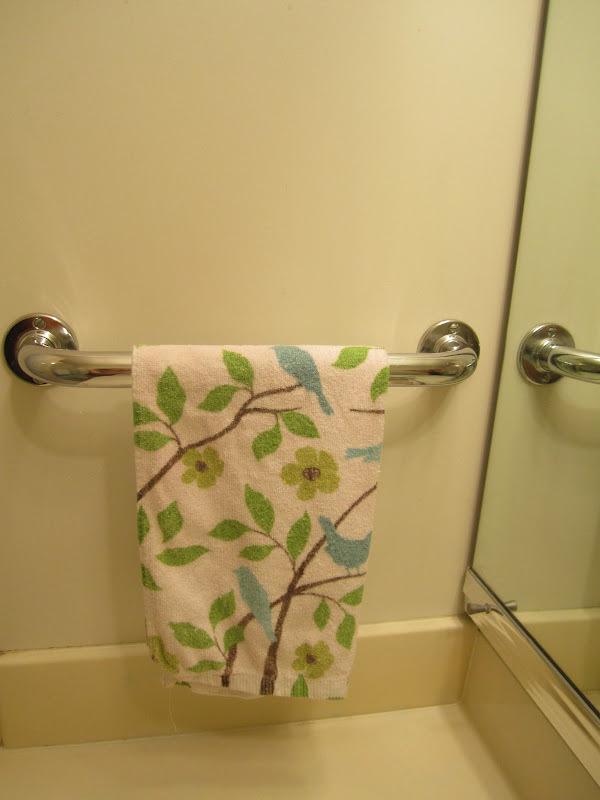 The towel bar was a standard 18 inches, and, of course, the space for my towel bar is far smaller than that. 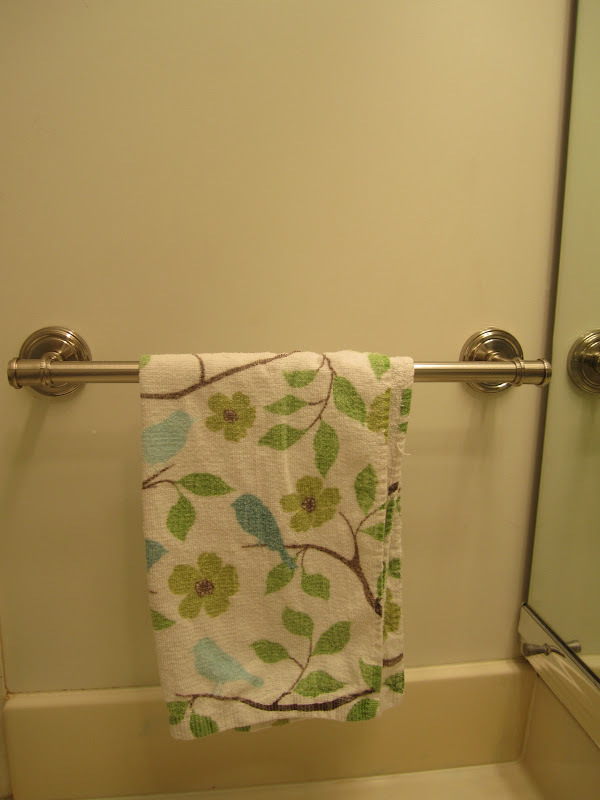 I just used a metal saw to cut the towel bar down to size and now it fits perfectly. Before: the door needed a little help. There was nothing on the back and, as you can see, there were remnants of a pretty sloppy paint job of a neon blue hue. Also, the outlet and switchplate covers were metal and rusted in spots. 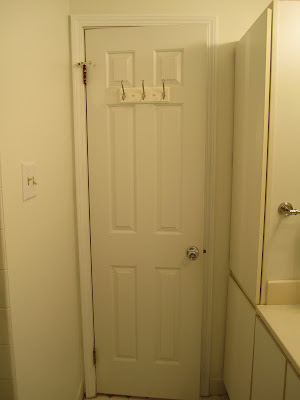 After: I added an inexpensive bar of hooks from Target and used off the shelf white paint to touch up the trim in the room. 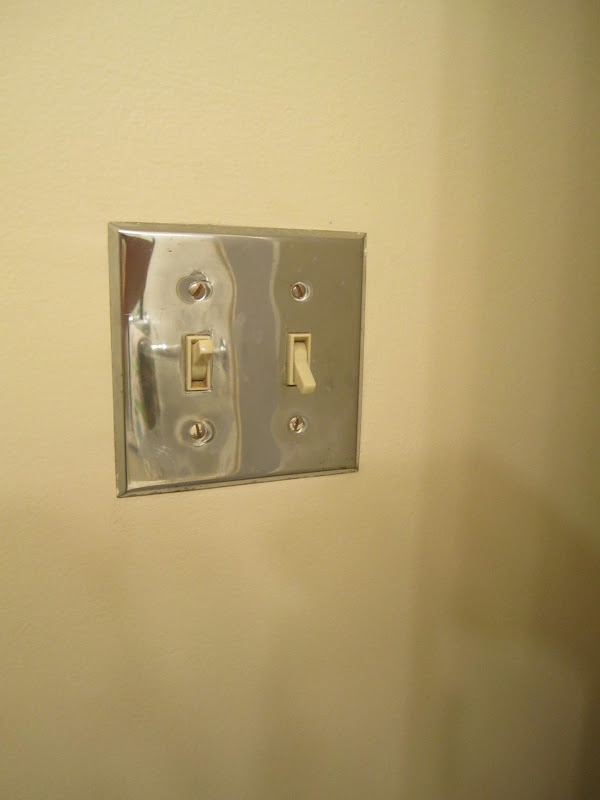 You can also see the new white switchplate cover that replaces the old metal one. Much better. 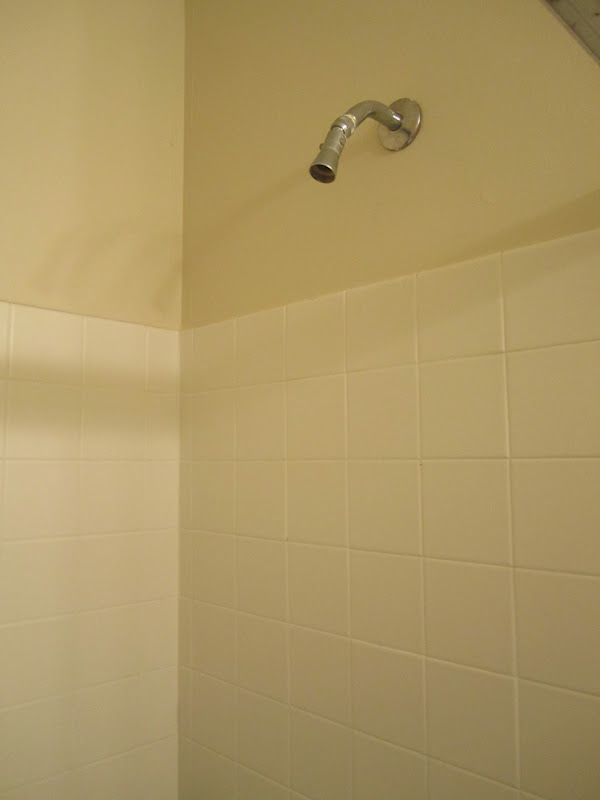 Before: the shower had a horrible showerhead, which had terrible water pressure (which is to say it had no water pressure). I had no idea until I decided to try it out one morning. Plus, there was no storage. After: I bought a $10 showerhead from Target and $12 shower organizer from Target, both in brushed nickel, and added them to the space. 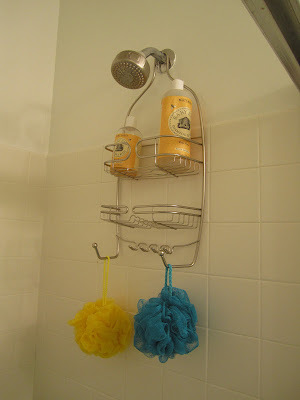 I have since used this shower to test it out and it's wonderful. You can see how much better the tile looks next to the white walls in this picture, too. Finally, here are some last shots of the space, including the art that I added (the large piece of art is from Pixie Pixels on Etsy. 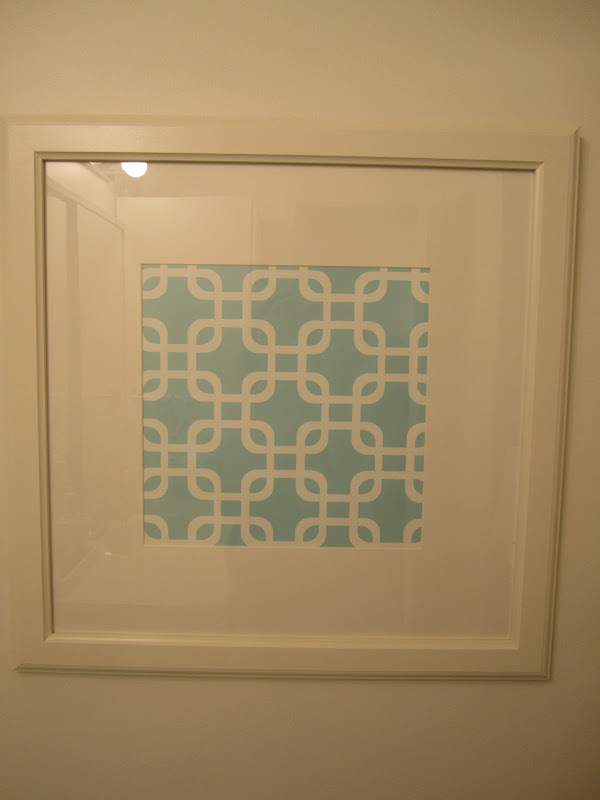 I paid just $15 and bought the frame at IKEA), in addition to the little print I already had (and paid $.70 [yes seventy cents!] 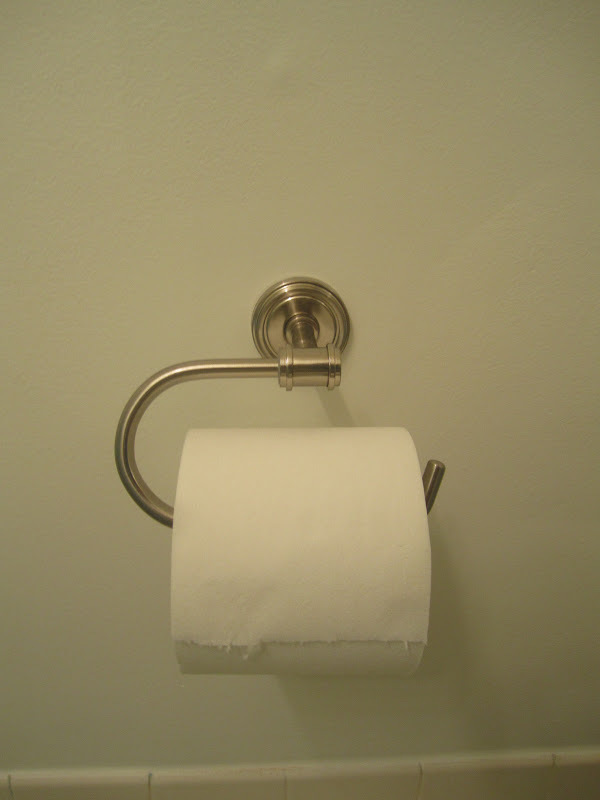 at Marshalls years ago), which I hung over the toilet. I'm really so happy with it. 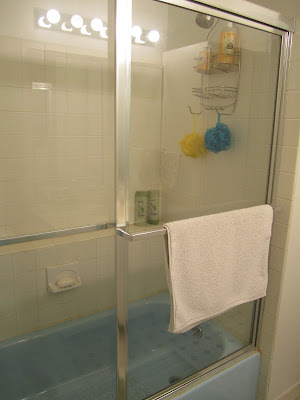 All told, I spent less than $100 transforming the space into a brand new bathroom ($30 for the paint, $25 for the towel bar and toilet paper holder, $22 for the showerhead and shower organizer, and the rest for accessories and art). Not bad! 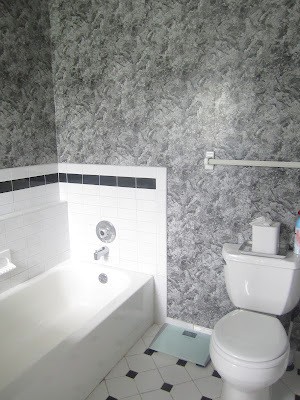 Next up: stripping the wallpaper and repainting my master bathroom. I'll give you a sneak peak ... the wallpaper screams 1983 bachelor pad. 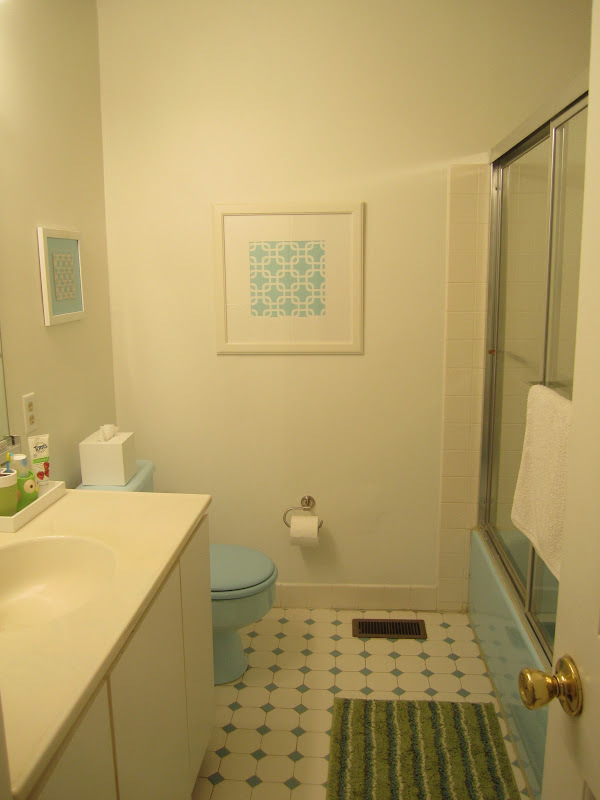 If there were ever a "before" begging to be an "after", this space is it. Giddy up. Great transformation using small details. 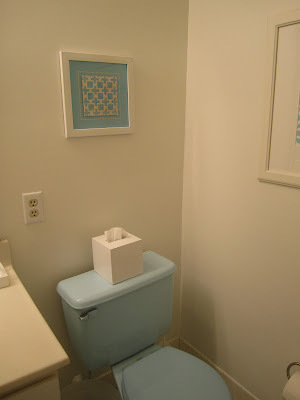 I really love how the large print adds so much to the bathroom. 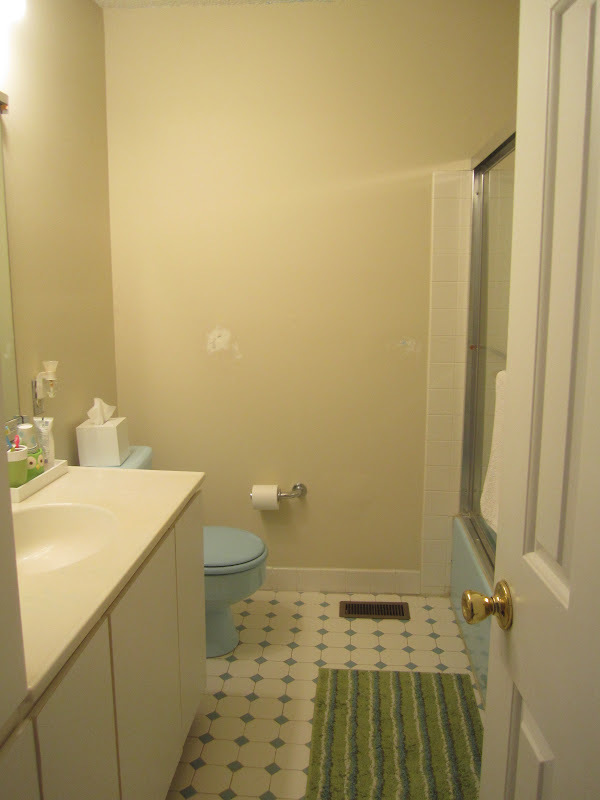 Can't wait to see how the other bathroom turns out. I really like the black and white checkered floor. Good Luck. I would love if you checked out my latest before and after kitchen makeover. Following you now!